Is Peanut Butter a Good Fat or Bad Fat? Peanut butter contains healthy unsaturated fats and unhealthy saturated fats, but the mere presence of bad fat does not suddenly kick it into the unhealthy camp, according to Harvard Health Publications. It's more important to look at the ratio of good to bad fats. 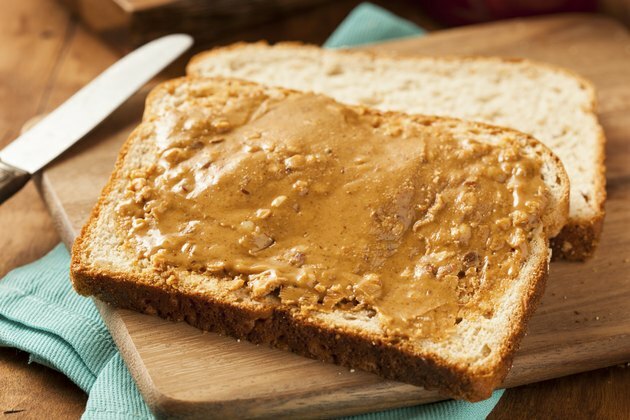 As long as you stay within daily fat and calorie goals, the benefits you'll gain from the high amount of good fats in peanut butter outweigh any bad fats. Unsaturated fats, otherwise known as the good fats, include poly- and monounsaturated fats. These good fats, when used in moderation, can benefit your health by decreasing your risk for certain diseases such as heart disease. Unsaturated fats lower bad cholesterol and improve good cholesterol, according to Harvard Health Publications. You'll get these healthy fats from fish oils and plant-based foods, such as vegetable oils, nuts, seeds and soybean oil. Two tablespoons of peanut butter contain 8 grams of monounsaturated fats and 4 grams of polyunsaturated fats. Saturated and trans fats are considered the bad fats because they have a negative effect on heart health. Saturated fats increase levels of bad cholesterol without affecting good cholesterol. Trans fats are worse because they increase bad cholesterol while lowering levels of good cholesterol. Saturated fats are mainly found in animal-based food products such as high-fat meats, whole milk and full-fat dairy products. A 2-tablespoon serving of peanut butter has 3 grams of saturated fats, but it doesn't have any trans fats. The whole package of nutrients you'll get from peanut butter make it a healthy choice when consumed in moderation. Even though it has 16 grams of total fat, 80 percent of the total consists of healthy unsaturated fats, which is similar to olive oil for the ratio of good to bad fats. One serving, or 2 tablespoons, of peanut butter contains 2 grams of dietary fiber, 6 grams of total carbohydrates and 8 grams of protein. It's also a good source of vitamin E, vitamin B-6 and magnesium. With 188 calories in a 2-tablespoon serving, peanut butter should be consumed in moderation to prevent weight gain. The U.S. Department of Agriculture Dietary Guidelines for Americans 2010 encourages adults to limit overall fat consumption to 20 to 35 percent of their total daily calorie intake, and limit saturated fat intake to less than 10 percent of their daily calories. For a 2,000-calorie diet, this means consuming between 44 and 78 grams of total fat and less than 23 grams of saturated fat.